16 November 2018 (Toronto, ON) – On December 14, Island/Ume/Universal Music Canada, the country’s leading music company, will celebrate the 10th anniversary of alt-rock kingpins The Killers’ third studio album Day & Age in style with a remastered double-LP deluxe edition that features three bonus tracks, preceded a month earlier on November 16 by three separate eSingle releases, all with content making its digital debut. 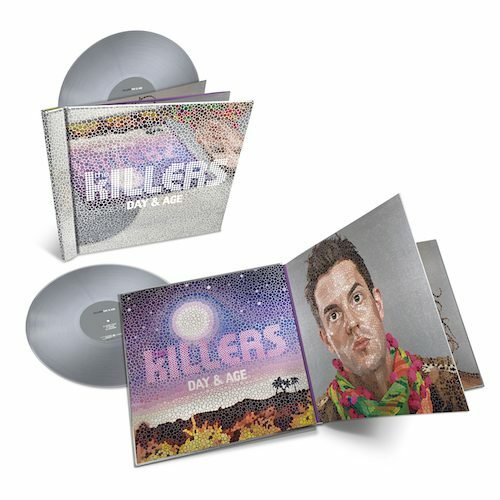 Preorder The Killers’ Day & Age – 10th Anniversary Deluxe Edition vinyl HERE. Although Day & Age was previously issued as a single 180-gram black vinyl LP, this special 10th anniversary edition marks the storied album’s first appearance on 2LPs (cut at 45 rpm). Besides the standard 180g 2LP black-vinyl version, a double silver-gray vinyl limited edition will also be made available. Both deluxe packages are housed in a hardcover case that features a patterned foil surface that will reflect the “portrait” of the viewer, referencing the bandmember portraits that are seen on the inner sleeves. Released in November 2008 and produced by Stuart Price (Madonna, Kylie Minogue, Pet Shop Boys) and The Killers, the triple platinum Day & Age album includes the heartfelt hit singles “Human” and “Spaceman”. The 10th anniversary edition’s bonus tracks include “Forget About What I Said” (the B-side from the “A Dustland Fairytale” single), “A Crippling Blow” (the B-side from the “Human” single) and “Joy Ride (Night Version)” (the B-side from the “The World We Live In” single) — the last two being currently unavailable digitally. In addition to the deluxe double-vinyl edition, three digital eSingles/bundles will be released a month ahead of the vinyl reissue on November 16 to highlight the key Day & Age tracks “Joy Ride”, “Human”, and “Spaceman”. “Joy Ride (Night Version)” is making its digital debut, while “Human” boasts six remixes and a B-side not currently available digitally (“A Crippling Blow”). Armin van Buuren, Ferry Corsten, and Thin White Duke are among those reimagining “Human”. Finally, “Spaceman” soars with rare remixes of its own and a Bright Eyes cover of “Four Winds”, a B-side also not currently available digitally. Tiesto, Sander Van Doorn, and Bimbo Jones are all part of the ace “Spaceman” remix crew. Last year, The Killers debuted right where they belong at the top of the album charts in both the U.S. and the UK with their stirring September 2017 release Wonderful Wonderful, which also carries the distinction of being the band’s fifth consecutive UK chart-topper overall.